HBO Sports’ groundbreaking “24/7” reality franchise, which has captured 18 Sports Emmy® Awards, will return for its 24th boxing installment with 24/7 CANELO/GGG 2, it was announced today by Rick Bernstein, executive producer, HBO Sports. The behind-the-scenes show follows two elite fighters – Canelo Alvarez and Gennady “GGG” Golovkin – as they prepare for their highly anticipated middleweight championship mega-fight title rematch Saturday, September 15 at T-Mobile Arena in Las Vegas. 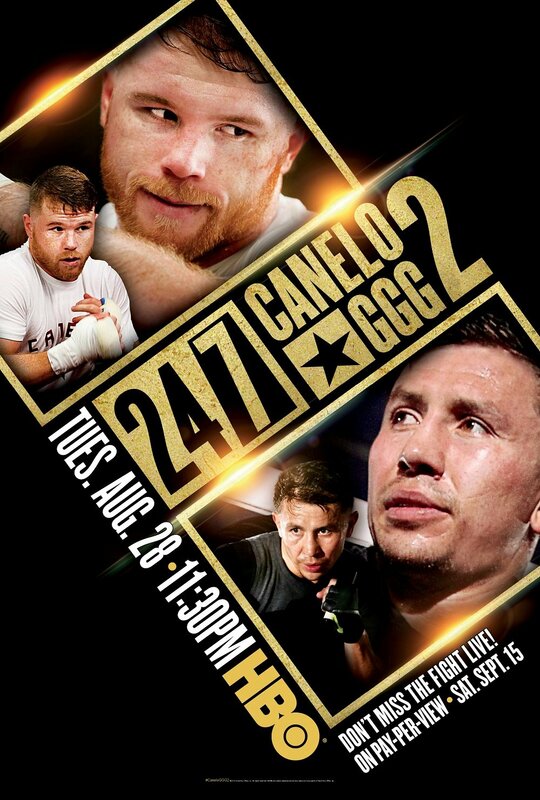 24/7 CANELO/GGG 2 debuts TUESDAY, AUGUST 28 at 11:30 p.m. ET/PT. The show will also be available on HBO On Demand®, HBO NOW, HBO GO® and partners’ streaming platforms. 24/7 CANELO/GGG 2 will provide exclusive behind-the-scenes access, along with in-depth interviews and a profound lookback at their first encounter which ended in a controversial draw. Both men have made it clear they do not plan to leave the decision in the judges hands the second time around. Canelo Alvarez (49-1-2, 34 KOs), of Guadalajara, Jalisco, Mexico, is again holding camp with renowned trainer Eddy Reynoso. The Mexican superstar, who recently turned 28, has established himself as the sport’s top pay-per-view attraction. Canelo will be making his 2018 ring debut in the sports most anticipated rematch on Mexican Independence Day weekend. Gennady Golovkin (37-0-1, 33 KOs), from Karaganda, Kazakhstan, now living in Los Angeles, is training with the acclaimed Abel Sanchez. The undefeated knockout machine, who turned 36 earlier this year, will attempt a historic record-breaking 21st title defense which would pass sure-fire Hall-of-Famer Bernard Hopkins. Golovkin made his 2018 ring debut on May 5 in Carson, CA. with a spectacular knockout over Vanes Martirosyan. Canelo’s fifth “24/7” appearance and Golovkin’s third, 24/7 CANELO/GGG 2 is the latest installment of the acclaimed franchise that began in 2007. Among the most-honored sports series on TV, it was called “a masterfully entertaining reality show” by ESPN The Magazine. “Canelo vs. GGG 2” will take place at the T-Mobile Arena in Las Vegas on Saturday, September 15 at 8:00 p.m. (ET)/5:00 p.m. (PT), and will be produced and distributed live by HBO Pay-Per-View®. The executive producer of 24/7 CANELO/GGG 2 is Rick Bernstein; senior producers, Dave Harmon and Bentley Weiner; producer, Harley Glantz; writer, Aaron Cohen. Liev Schreiber narrates.